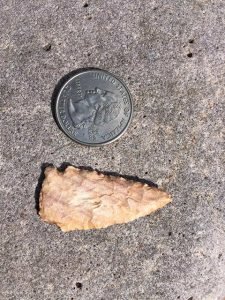 On a recent walk in the forest on the outskirts of Grand Canyon Village, I stumbled upon a projectile point left behind by an indigenous hunter a thousand or more years ago. 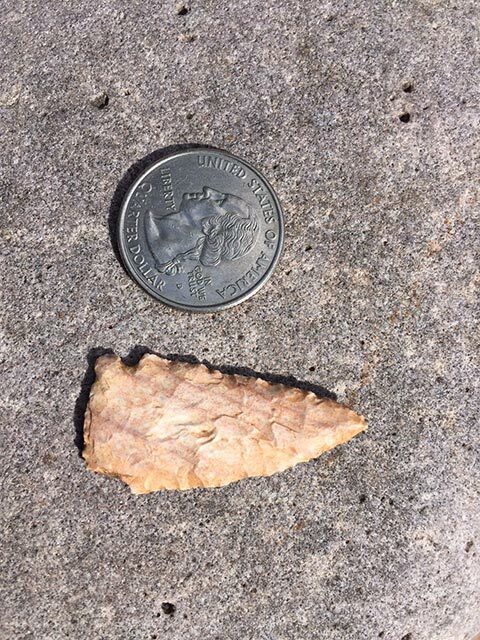 Not much larger than a quarter, the sharpened piece of chert was likely the working end of a dart that was launched by a handheld catapult of sorts called an atlatl. Archaeologists have confirmed that humans have been in the Grand Canyon region for the past 12,000 years, and they have identified 4,300 hundred resources by surveying just six percent of Grand Canyon National Park. Though small discoveries like mine are always thrilling, finding this artifact a stone’s throw from my home in the park felt extra special. Being reminded that my neighborhood of the past twenty years has such a rich human history is as exciting as it is humbling. As always, if you’re lucky enough to find a cultural treasure such as this, enjoy it for a moment, then please leave it where it was found; both in respect for the people who left it behind, and for the researchers who may one day use it as a clue to further our understanding of the intriguing men and women who carved out an unlikely existence in this amazing landscape.